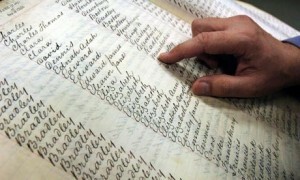 Many vital records including birth, marriage, census, military and death have countless errors. Especially true when it comes to a person’s given name and surname. The clerk filling out the birth record, marriage license, deed, etc. may have had only an 8th grade education. The clerk may not have understood the individual when information was provided. There could be errors in spelling or the handwriting was poor and difficult for anyone to decipher. Those are just some of the possible reasons for errors on records, making family history research more difficult. An ancestor may not have able to spell their own name, only pronounce it. When a minister or government official heard the surname, they each could have come up with an alternative spelling. An example is the surname Nelson which could be spelled Nealson, Neilson, Nilsen, Nellson, Nilsson, Nielson or Nilson. In addition, surnames have evolved over time, usually to a more American spelling after an ancestor immigrated to the United States. An example would be the German surname of Franckfurter changed to Frankforter. Even the names Doerner, Durner or Tournor might be changed to Turner due to the way it was pronounced. Within families, a brother and his family may have selected a certain spelling they wanted for the family name while the remainder of the family kept a different spelling. An excellent example from a family in Pennsylvania during the late 1700s was the original family name of Grevel from Germany. One son used the Grebel spelling, a daughter the Grable spelling (even after she married) and the parents changed their surname to Grabill. Yet, another variability reason might be when an ancestor selects to break all ties with their family, becoming estranged from them including their own family name. They could start using a surname not even similar to the original family name. An individual might want to conceal an ethnic, nationality or religious designation, so will alter their name. Surname spellings over time will change even if the family has not relocated to another area. An example in England is where a family had not ever emigrated, but remained in the same Shropshire area. The family name in the 1820s was Juckes, then by the 1840s it was Jukes and by the 1850s it was Jewkes. The best assistance a family researcher can have is by keeping a list with each ancestor and any possible surname variations. When doing research on census, property, church or governmental records check those other alternative surname spellings. When a spelling difference is located, note that spelling, the date and the type of record. Checking alternative spellings by taking a few extra moments can possibly breakthrough some stubborn brick walls in searching for your ancestors.